I think Mexican food is one of my all time favorites. Growing up in Southern California, the availability of “good” Mexican food was not hard to find, it was everywhere. I have so many old favorite places that served everything from Tex-Mex cuisine to more authentic regional Mexican cooking. I do miss those places. Badly. 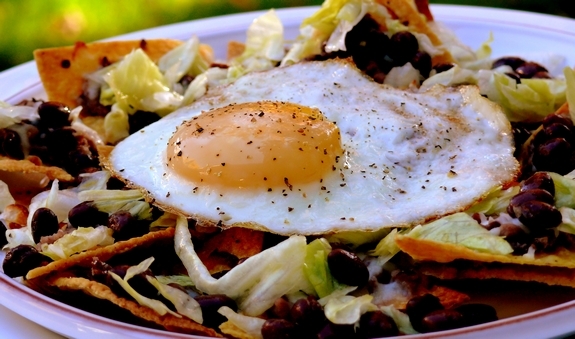 This particular dish is a take on Huevos Rancheros (Ranch Eggs), a classic Mexican breakfast dish usually consisting of fried eggs served on top of corn tortillas with a chili-based salsa and avocado. It’s an awesome way to start the day! But I have to say this salad also has many of my favorite ingredients…black beans, green salsa, chips and cheese. 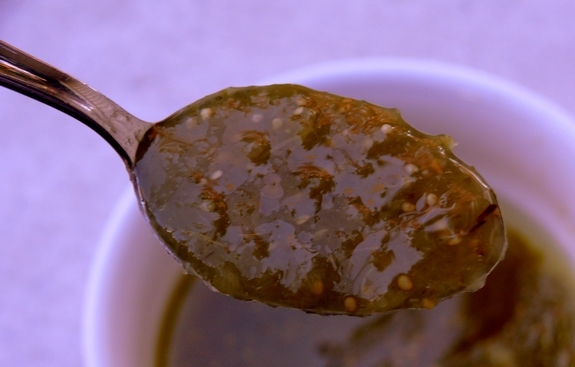 The tomatillo or green salsa gives so much flavor. I have always preferred a green salsa over red anyway. The broiling of the chips also gives them that extra-toasty crunch which is just makes it all worth the trouble. It’s a great main meal for lunch or dinner, and why not breakfast and it explodes with flavor. Why wait, make it today…it’s also extremely economical. Adios amigos and let us know how you like it!! And did I mention there is another giveaway coming soon? Preheat the broiler. Line a baking sheet with parchment. In a medium bowl, whisk together 1/2 cup salsa and 2 Tablespoons olive oil; season with salt and pepper if needed. In a medium bowl, mash half of the black beans with the remaining 3 Tablespoons salsa. 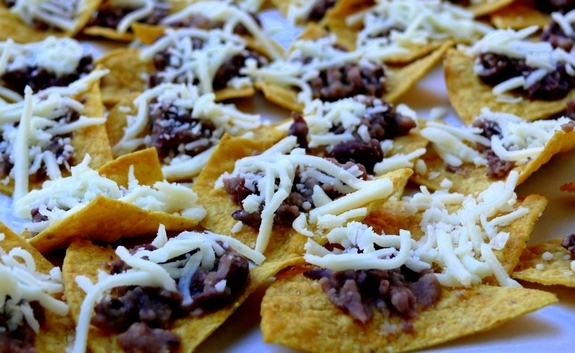 Arrange the tortilla chips on the prepared pan and top with the mashed beans and the cheese. Broil until melted, about 3 minutes. 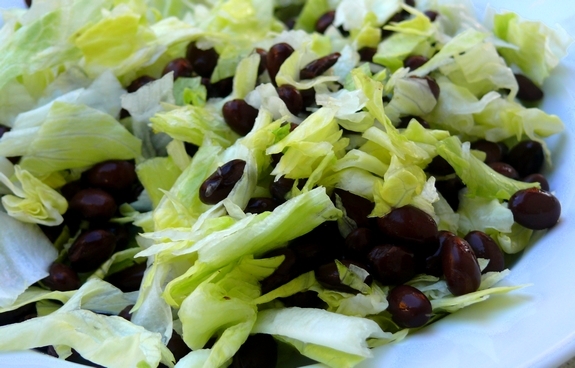 In a bowl, toss the lettuce and remaining black beans with the salsa. Divide the tortilla chips among 4 plates; top with the salad. In a large nonstick skillet, fry the eggs in the remaining 2 Tablespoons of olive oil over medium-high heat. Place an egg on top of each salad. Enjoy one of the best salads ever! The end. Oh my word I have to have this…mouth watering just thinking about it! Headed to store right now for the salsa & the beans…thx for this. Where do you find the time? Or are you like me, between midnight and 2 am? Another tasty treat from you! Your boys looked really cute for Halloween, and you looked fantastic. I think you are really enjoying living your dream! Lots of work but so worth it. When I come to visit, I would like you to make this for me;) Thanks. thank you for using the rare iceberg… I LOVE it for all of it’s crunchiness! this looks fabulously delicious! love to top my salad with an egg. i’ve been staying gar away from carbs so i need new ideas for kicking up (protein-wise) my salads. Perfect for one of my backyard eggs! Ilove anything Mexican, food that is. 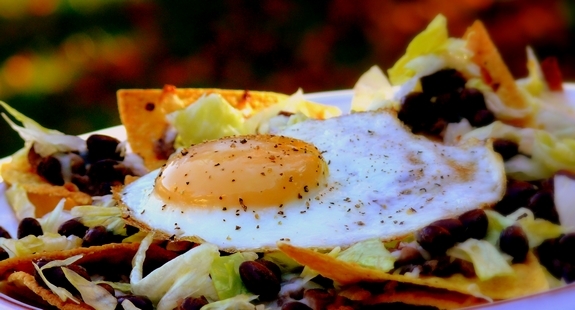 Heuvos rancheros was one of the things I loved when I lived in California, especially as a weekend brunch, and, you’ve guessed it, it’s not so common over here in Ireland. You’ve reminded me that I need to go and make this for myself and soon! This salad looks fun! Anything with an egg on top intrigues me. Very appealing. This looks SOOOOOO good! I think I’m going to make some right now!